“In a time when promotion is so frequently mistaken for ability, and hype for art, Alan Rinehart remains aloof from these areas of quick profit and meretricious ‘triumph’, devoted to the genuine welfare of his instrument as a medium of music and the maintenance of worthwhile musical values. This recording was conceived of as a musical equivalent to a culinary banquet. 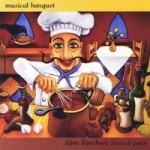 Taking the dictionary definition of banquet (‘an elaborate or extensive feast”) as a starting point, the works presented here follow a path through musical styles as one would enjoy a fine meal. A classic appetizer sets the ‘meal’ off, followed by an ‘antipasto’, two courses of ‘chef’s specials’ each full of many colours and ‘flavours’, a lighter dessert course and a rousing finale to send the listener home with a smile. Very little is known of Anthony Holborne’s life. He was born around 1540 and died late in 1602. His lute works show great compositional skill and their technical difficulty attest to what must have been considerable skill as a player as well. The great Elizabethan lutenist John Dowland dedicated one of his works to “the most famous Anthony Holborne”. Over 50 of his lute works have survived as well as music for the bandora and cittern, popular consort instruments of the time. Both cittern and bandora were strung in pairs like a lute, but unlike the gut strung lute, they use bronze strings. The bandora was the bass accompanying instrument in the Elizabethan ‘broken’ consort (flute, treble viol, lute, cittern, bandora, viola da gamba) and would usually play a relatively uncomplicated role in the group. Some composers, most notably Holborne, did create solo repertoire for the bandora. The bandora has 7 courses (pairs of strings) an the top 5 strings are tuned the same as a modern guitar, E B G D A, with the lower two being G and D.
Isaac Albéniz (1860-1909) travelled all around Spain writing works that reflect the particular region he visited. A pianist of superb ability, he mimicked the sound and texture of guitar playing so well that many of his works, in arrangement, are now standard guitar repertoire. This work, written in 1890, is sub-titled Barcarolle (Venetian boat song). It captures the shimmering beauty of a Mediterranean sun setting over the village church on the ancient terraced island of Mallorca. When I was asked to write a work for him I bore these things in mind, and, rather than provide something ‘cheap and cheerful’, I decided to write something of serious intent. Though we discussed the work in detail on several occasions, the final interpretation was shaped by him and it was one that I found entirely satisfactory and in accordance with my own overall view of the music. John W. Duarte was recently awarded a lifetime achievement award by the Guitar Foundation of America in recognition of his unique influence on the classical guitar world over the last half century. His works have been recorded and performed by many of the most important guitarists of the last three generations including Andres Segovia, John Williams and Sharon Isbin. ‘Rockero’ is related to rock music, anyone or anything connected with rock music can be described as ‘rockero’. The influence of rock on Argentinian music has been great, notably so on the tango. ‘Triston’ is derived from ‘triste’ (sad); it’s probably a kinder more affectionate way of expressing someone’s melancholy. ‘Curda’ is a slang term for drunkard. It is an ever present word in tangos and poems of Buenos Aires. ‘Tangueada’ means ‘in the style of the tango’. The prelude attempts to describe the secrets of a porteño’s (resident of Buenos Aires) binge. The Candombe is a ritual dance in the Afro-South American culture of Macumba. Máximo Diego Pujol was born in Buenos Aries in 1957. As a performer he has appeared throughout Argentina and at guitar festivals in Europe. His guitar compositions have won awards at competitions in Colombia, France and the World Guitar Festival in Martinique. In 1989 he was awarded the prize of ‘Best Composer of Classical Music’ by SUAYCA (the Argentine composers association). His work is strongly influenced by the great Argentine musician Astor Piazzolla. Like Piazzolla, Máximo Pujol uses the tango as a basic style to build wonderfully colourful, melodically rich works that make full use of the guitar’s expressive powers. Both Abraço e neto a lea and Parazula feature the use of a ‘scordatura’ tuning of the guitar. While this is not unusual in guitar literature, these particular tunings are quite uncommon. Abraço e neto a lea has both E strings tuned down to D and in Parazula the top E string is tuned to D. Abraço is a “hug’ for two musician friends. Parazula imitates the sound of the harp and combines Paraguayan, Argentinian and Venezuelan rhythms. Originally from Sao Paulo, Brazil, Celso Machado now lives in Vancouver, BC, Canada. His ever active musical mind has led to his collaboration with musicians from all parts of the world. These pieces show not only his remarkable command of the guitar fingerboard but also his deep understanding of the music of his homeland. The first two-time winner of the U.S. Fingerstyle Guitar Competition, Don Ross is based in Toronto, Ontario and has performed to unanimous acclaim throughout North America, Asia and Europe. A true master of the steel string acoustic guitar, he is also a fine singer, composer and a wonderfully humorous stage performer. Written as a reminiscence of an embarrassing horse back ride when he was 14, this piece shows Don Ross’ infectious, rhythmic and joyful acoustic guitar style at its best. The guitar is tuned FACGCE. Alan Rinehart has made many contributions to the guitar world as a performer, teacher, and music editor. Completing studies at Western Michigan University and a Professional Music Training Diploma from Vancouver Community College, he studied lute repertoire and technique in London England at the Early Music Centre with Anthony Rooley, Jakob Lindberg, and Emma Kirkby. His study of historical performance practices led to the ability to play the lute with a softer ‘no nail’ sound and the guitar with standard concert guitar technique. In 1980 he gave a critically acclaimed London debut (“consistently clean and musical…he has a pleasantly relaxed stage manner which won over the audience right from the word go”. Guitar International magazine). In addition to many concert recitals he has performed at international guitar festivals in Toronto and Quebec and on CBC radio and TV. 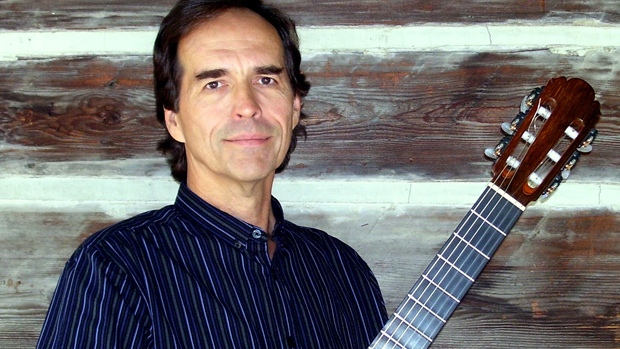 Alan Rinehart is also a co-founder of The Vancouver Guitar Quartet which has become a regular part of the Vancouver and Western Canadian music scene. The Quartet has recently released its debut recording “Estampas” (VGQCD98882). Alan Rinehart has prepared the first guitar performance edition of the Moscow lute manuscript of Sylvius Leopold Weiss for Editions Orphee and a two volume edition of the works of the Romantic Spanish composer Antonio Gimenez Manjón for Chanterelle Verlag. He has been a faculty member of the music schools at the University of British Columbia and Vancouver Community College since 1983. Recorded between January and March 2000. Special acknowledgements and thanks go to Stuart for his patience, Celso for his invaluable advice and expertise, Will for his wonderful artwork and most especially to my wife for her love and support over the years.